MSR Access 1 Tent. An ultralight, four-season solo tent, the Access 1 winter touring tent was built to meet the needs of backcountry skiers, splitboarders and snowshoers. Lighter than a mountaineering tent, but warmer than a three-season backpacking tent, it offers ample comfort on cold winter nights, yet remains light in your pack while skiing or hiking. 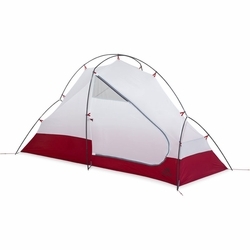 The tent features a central-support frame that withstands overnight snow loading, and offers generous space inside for bulky gear. Ideal for the protected winter conditions found near tree-line, the Access 1 tent strikes the perfect balance of winter-grade warmth without the weight. Ultralight Warmth: Limited mesh on the tent body keeps in all that hard-earned warmth on cold nights, while the tent�s light design keeps you nimble while on the move. Easton� Syclone� Poles: Cutting-edge composite materials resist breaking in challenging winter conditions. Additional Features: DuraShield�-coated fabrics and taped bathtub floor; one door; one internal pocket; multiple guy points.